I must thank the person who gave me the award and list their blog and link it: Thanks so much to The Lost and Found Vintage. She has great featured vintage Etsyians on her blog very consistently (love to read them!!! ), and her shop is incredibly well-stocked. She has great sales in a very short time to show for it!!! 2. I learned Spanish in college and now speak it pretty close to fluently – just don’t try to strike up a conversation with me about welding or open heart surgery… :) I took a year of Arabic in college and am about to try to pick that back up. I aspire to speak about five languages! I think that knowing another languages opens up a huge part of the world to you and makes it a whole lot smaller, and we need that right now. 4. I have been a vegetarian for a couple years now and love it. I can recommend lots of recipes if you’re contemplating a journey to the dark side! 5. I have two darling kittens, the loves of my life, Mish and Rosco. They are holy terrors, and it’s all my fault! They make my life much more enjoyable, and I love having somebodies to take care of. 6. I am incredibly claustrophobic. I will seriously start hyperventilating at the mere thought of being in a small room. Or a plane. Or a flight of stairs up to, say, the Statue of Liberty or a gorgeous old building in Italy – if I think I can’t turn right around and leave whenever I want to. It turns me right back into a four year old, and I’m being generous here. Basically, I don’t like to be trapped anywhere. Ever. 7. I have had just about every job on the planet. Okay, I’ve never been a trash guy or an astrophysicist, but I’ve done all the other ones that you can think of. 10. I used to be one of those people who swore off television as a brain-rotting waste of time, but now I’m a hypocrite addict. I love CSI, NCIS, and True Blood. Oh, how many hours of my life in the last couple weeks were lost to catching up on True Blood before the next season comes out… I’m still trying to decide whether or not I should be ashamed… No wait – I’m not. 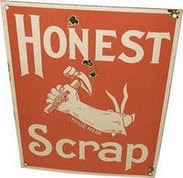 I must notify my select seven by commenting on their blogs so that they will hopefully do all of the above and keep the Honest Scrap award going! P.S. Don’t forget to enter this week’s giveaway!!! Wow! I am shocked my blog was selected. Thanks so much and congrats to you on your award! Congrats on the award!! Thanks for passing it along to me too:-) Have a great day!